Trixi® Berry Daring Combination – MiniFamous® Compact Purple, Light Pink + Eye, and Royal Blue come together to make the most delicious looking combination we have ever seen! These blooms can stand up to the hottest summer sun and intense rain showers! Pop Culture Combination – these eye catching colors will look beautiful on your patio! 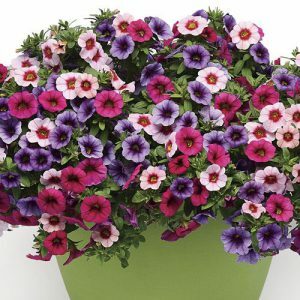 Petunia, Verbena, and Lobelia work perfectly together in a mixed container or hanging basket! These primary colors would make a beautiful addition to any patriotic party! Royal Gold Mix – allow these contrasting colors to make a statement to your borders, baskets, or beds! This combination of burgundy Petunias paired with Gold Impatiens and white Scaevola will catch everyone’s eye! This vigorous and colorful mix will last you all season! Spring Picnic Combination – Do you want extravagant floral beauty in a low-maintenance package? Time to take a Spring Picnic! 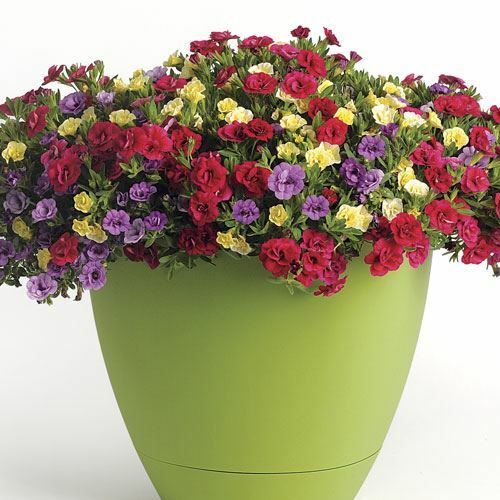 Striking red Lanai® Scarlet with Eye, playful Lanai® Upright lime green and royal Calibrachoa Callie® Dark Blue Improved all blend together to give a stunning and reliable performance which enriches containers of all sizes. Trixi® Salt Water Taffy Combination – A beautiful combination of Verbena, Petunia, and Million Bells! 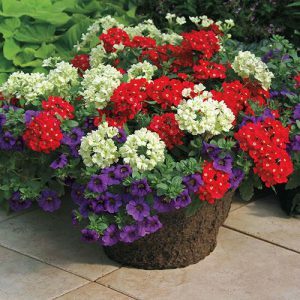 Minifamous® is known for its vigorous growth and trailing habit, so that makes it a wonderful addition to any annual combination! Designed for containers such as hanging baskets and window boxes, this combination will earn you plenty of compliments! Glamorous Girl Garden Combination – This is a bewitching blend of reds and pinks and varying textures which have a great impact on the summer annual garden. Each variety is heat, drought and humidity tolerant as well as highly visited by butterflies and hummingbirds. All are easy to grow, needing only plentiful sunshine, regular water and feedings to flourish and take off from late spring to early fall.